On most roads, however busy, the traffic usually stops at some point.. Not so in downtown Hanoi on a Saturday night, where it flows as relentlessly as a torrential river. I stood staring at this constant run of light, colour and noise for just under ten minutes, hoping to make it across to the ATM and ice-cream shop, before finally giving up and trying to find another way across. There was never a break in the traffic, and if there were lights somewhere along the road, nobody was paying them any heed. It seemed such a short distance – three narrow lanes – yet the vehicles simply never stopped coming and despite a rather cavalier attitude to traffic, I wasn’t about to make a foolhardy dash for it. There is, no doubt, a method to this madness. 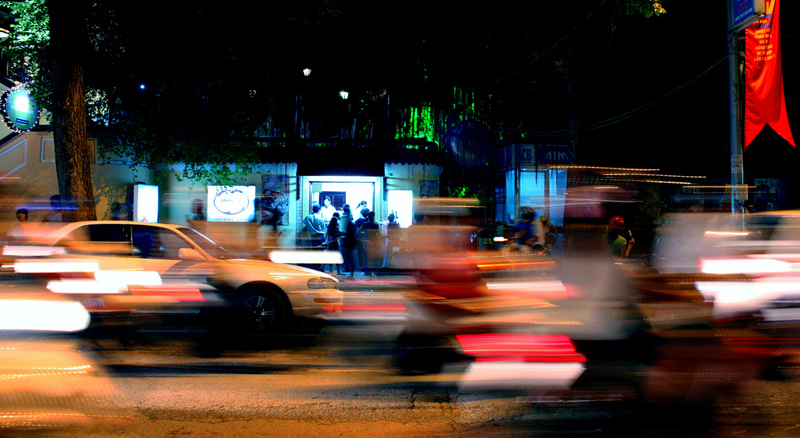 The flow of traffic in busy Asian cities is astonishing in its intensity and density, yet no one ever seems to crash. Of course, the statistics indicate that many people do indeed crash, often fatally, yet the vast bulk of the time cars, auto-rickshaws, motorbikes, trucks, vans and bicycles weave through and whizz around each other like mosquitoes on speed, without blinking, and, seemingly, without thinking. It is as though they are mathematically repelled by each other and each finds their own crooked path. When I did finally make it to the ice-cream shop, it felt curiously like Christmas. The pavement on the street corner, off the left-hand side of this image, was so littered with wrappers from ice-blocks that it was like the lounge-room floor after a bumper present-exchange, or some artificial autumn. I watched, amused, refusing to be disappointed by the complete nonchalance with which people simply threw their wrapper on the ground, without even looking for a bin, as though they couldn’t get rid of it fast enough. Having bought my ice-cream, I couldn’t bring myself to do it, and whereas in Australia I might discard something into a bin with pride, feeling like a good citizen, on this occasion, when I did find a bin in which to put my wrapper, I felt strangely like a fugitive. Enter your email address to follow Tragicocomedia and receive notifications of new posts by email.